The Series XTBX is a diaphragm seal constructed of PVC and Teflon® making it perfect for corrosive applications that would damage metal wetted material pressure switches. 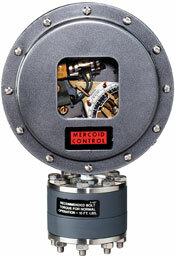 The seal is available direct mounted on all model DA pressure switches with ranges under 100 psi (6.9 bar). Ideal for commercial pool/spa applications for pump shut down due to excessive vacuum. Seal shown mounted on DA Series Pressure Switch. Connection: Female NPT, Available in 1/4", 1/2", 3/4", 1", 1-1/4", and 1-1/2"
Wetted Materials: PVC bottom bowl, Teflon diaphragm. Materials of Construction: PVC top bowl, 316SS bolting. Maximum Pressure: 20"Hg (508 mm Hg) Vac. to 100 psi (6.9 bar). DA pressure switch with range 1/8 to 15psi (0.1 - 1.03 bar), direct mount XTBX seal with 1/4" NPT connection, adjustable differential, SPDT snap switch rated 15A @ 120/240 VAC, general purpose enclosure. DA pressure switch with range 0 - 20"Hg (0-508 mm Hg) vac., direct mount XTBX seal with 1/2" NPT connection, Fluorolube fill, manual reset switch - automatic operation on increase of vacuum, SPDT snap switch rated 15A @ 120/240 VAC, weatherproof (NEMA 4X) enclosure.